Clown loaches are very popular aquarium fish; however, they are not always easy to keep successfully since they easily succumb to ick and are sensitive to poor water conditions. This article is intended to help new clown loach owners provide a good home for their loaches. Clown loaches are found in Indonesia (Sumatra and Borneo), and almost all clown loaches in aquariums are wild caught and distributed around the world before being sold. This can put considerable stress on the fish, and a vital step in getting a healthy clown loach school in your aquarium is choosing healthy fish. But how to make sure that you get healthy fish? - Check the general conditions in the fish store. Are there dead fish in the aquariums? Is the water clean? If some tanks are mistreated there is a good chance that there might be unfavourable conditions in others too. Only buy fish from stores that take good care of their aquariums. - How do the clown loaches look? Clown loaches can give you an indication of their condition based on their coloration. A healthy clown loach shows clear distinct colours, while a stressed one loses its colours and becomes whiter. Only buy loaches that show their correct colours. - Are the clown loaches well fed? Those that haven't been fed correctly are hard to nurse back to health, and it is more than likely you will end up with a dead fish if you buy one. Look at their bodies and see if they look well fed, and ask the shopkeepers how often and what the loaches are fed. - Are the clown loaches active? Healthy clown loaches are very active and full of energy. 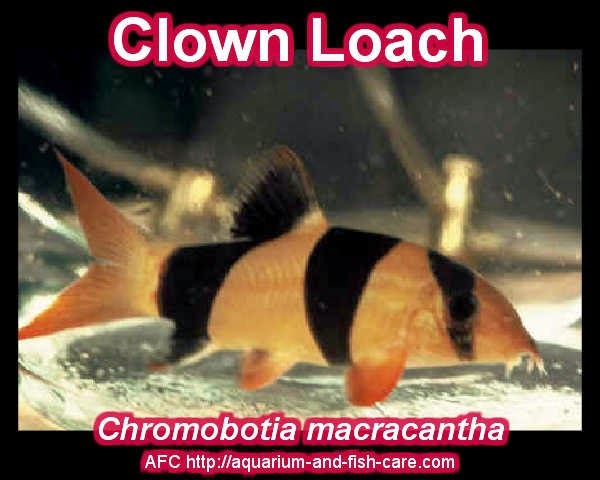 A healthy clown loach should be hard to catch. - Do the clown loaches have hiding places? Hiding places are very important to relieve stress in clown loaches, and you are likely to get higher quality fish from aquariums with hiding places. - Don't buy clown loaches smaller than 2 inches/5 cm if you haven't kept clown loaches before, since they are much more sensitive when they are younger. So ideally you should look for the most coloured, most active clown loaches you can find, and buy these to have the best starting point possible. You should also consider the water conditions in the store and try to find one that keeps their clown loaches in water condition similar to the water conditions in your aquarium, to reduce stress on the clown loaches. It should also be stated that clown loaches like resting on their sides, looking almost as if they were dead. However, this is completely normal and should not be seen as a sign of poor quality in the fish but rather the opposite. When you have decided where to buy your clown loaches you should buy at least 3 (preferably 8-10). Clown loaches are schooling fish that should never be kept alone!!! Once you get home with your new clown loaches you should let the bag float on the water surface for 10-15 minutes, and then slowly every 10 minutes add a little water from the aquarium (a coffee cup). Repeat this 4-5 times before you release the fish into their new home. Clown loaches can be kept in aquariums of 100 L / 20 G or more. Keep in mind that even though clown loaches grow very slowly they will get big eventually and need an aquarium of at least 540 L/ 125 G, and that should be considered a minimum. Decorate your aquarium using a bottom substrate of sand or fine gravel that allows the clown loaches to dig. I recommend keeping your clown loaches in a planted aquarium, however, the choice of plants differs greatly depending on whether you keep juvenile or adult clown loaches. Juvenile clown loaches can be kept with most plant species, while adults can be kept only with hardy plants such as Java fern and Anubias. All other plants will be destroyed and/or eaten by the adult clown loaches. I also recommend using floating plants to dim the lighting, which makes the loaches more active during the day. Clown loaches want a setup with a lot of caves and other hiding places, preferably so narrow that they can just barely squeeze themselves into them. Don't be concerned if your clown loaches have squeezed themselves into caves they dug under rocks or aquarium equipment. Odds are they are not stuck - they just like it that way. Hiding places can be created with rocks, roots, PVC pipes, flower pots, coconuts and different kinds of aquarium decorations. Sharp objects should not be used to decorate aquariums for clown loaches. You can not create too many hiding places and you should create several for each loach. Clown loaches are sensitive to poor water quality, and they require good filtration. Higher water circulation is also appreciated since clown loaches live in currents in the wild. Clown loaches are excellent jumpers, and you should make sure that your tank is properly sealed. As I said earlier, clown loaches are very sensitive towards poor water quality and are usually the first fish that get ill or die if the water quality drops. Water changes of at least 25% a week are recommended. Because of their low tolerance to poor water qualities, they are sometimes called indicator fish since their health indicates the status of the aquarium. Clown loaches are very sensitive to chlorine, and even small amounts can cause a mass death of loaches. These species are very prone towards getting ick if the water quality isn't good enough, and are sensitive to most ick medicines and salts. So keep an eye on your clown loaches and only use half the recommended doses of medicine, otherwise, you risk the medicine killing the loaches. Clown loaches are carnivores and only eat vegetables to complement their diet. It is therefore recommended that they are given food that reflects this. To get your clown loaches to grow, optimal feeding 3-5 times a day is recommended. (They still grow slowly). Their diet should contain a variety of foods and can include almost any carnivorous food. A good base may be shrimps, different sinking wafers, different frozen foods, and as they grow older, fish slices. Clown loaches can make a clicking sound, and they will do this when they are content. Therefore you will soon find out what is your loaches' favourite food by them clicking when they receive it. Like most other fish, clown loaches might need some time to accept new foods, however, once they do it might become a favourite. Clown loaches are one of the few fishes that eat and like snails, and can, therefore, be of good use in snail control. Clown loaches have been bred in aquariums, however, it is very rare. Sexing clown loaches externally is hard, but possible by looking at the tail fin. The tail fin tips on the male are slightly bent inwards, making the fin looks a little bit like a claw. The tail fin tips on the females aren't shaped like this. Clown loach fish are only found in Indonesia (specifically on Borneo and Sumatra). They live in murky backwater rivers where the water may be moving swiftly or standing still. The waters are densely vegetated and there is plenty of food for the feisty bottom-feeding clown loaches. They are on omnivorous and often enjoy eating crustaceans in the area or nibble on plants in the water. Borneo and Sumatra both straddle the equator so the temperature is quite high for most of the year. The temperature of the waters that the clown loach live in hovers around 74-85 degrees Fahrenheit (23-29 degrees Celsius). They live in large groups and densely populate the river beds. It is in the clown loaches nature to hide and they love hiding in spaces that they can barely fit into or dig themselves into the river bed with only their head sticking out. How can you use this basic information in designing a comfortable aquarium for clown loaches to live in? First and foremost, the clowns love to have places to hide and plenty of vegetation. You can build little caves with rocks or buy cave objects at the store. You can use old plastic piping, or that old model car you use to play with when you were younger. You can use pretty much anything to make a hiding place for a clown loach, but you want to make sure that there are no sharp edges. Since they enjoy squeezing into areas that are probably too small for them to be squeezing into you don't want them to get caught on sharp edges and injure themselves. As for the vegetation, pretty much anything will do, but if you want to go all out you can use plants that grow in Borneo's or Sumatra's rivers; for example, Cryptocoryne wendtii, Pista stratiotes, or Nuphar japonicum. The older the clowns become the more they like to nibble on vegetation, so stick to the fast growing and robust species of plants. Clown loaches sometimes dig themselves into the substrate of an aquarium, so make sure there is nothing sharp in the substrate since it may do them harm. It is also a good idea to create a current in the aquarium that the clown loaches can swim against. They are fast swimmers and they can grow to be quite large (up to 12 inches or 30 centimeters). That being said, you may have to upgrade to a larger aquarium. For full grown clown loaches, a 125 gallon (540 Litre) tank is recommended. This is one of the reasons that buying a clown loach is a long-term commitment. They can live to be more than 10 years old! After the setup and organization of the clown fish tank, there is still the problem of water quality. They are very sensitive to the water quality and they become sick much more easily than most other aquarium fish. Their natural waters have a pH that tends to be acidic (pH = 5-7) and water hardness between 7 and 12. After achieving those properties in your tank and keeping the water temperature between about 74-85F (23-28C) your clown loaches should be pretty happy. Don't forget that clown loaches get lonely really easily and when they're lonely they get stressed, their growth may stunt, their colours may fade (don't confuse this is with the 'graying out' of their colours with age) and they may die young. So, always keep your clowns in a group of at least 5 and they should be as happy as peas in a pod. The process of analyzing a fishes natural habitat and then trying to mimic it in an aquarium is known as biotyping. It is an idea that is recommended by many aquarists.